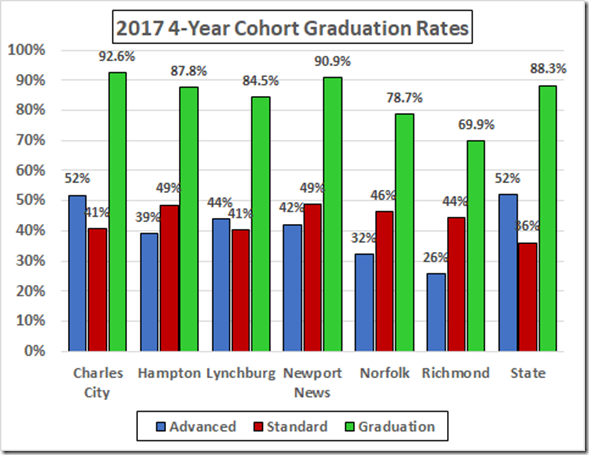 The 2017 4-Year Cohort graduation and dropout rates are up on the VDOE Web site. We have the highest dropout rate in the State. In terms of a graph, here is the Richmond dropout rate, along with those of the peer cities Hampton, Newport News, and Norfolk, as well as Charles City and Lynchburg (where I sometimes have a reader) and the state average. 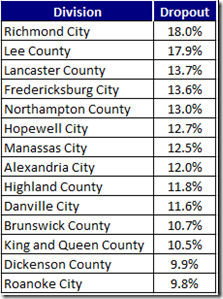 VDOE did a press release to brag about the “on-time” graduation rate. As with the Accreditation process, they have jiggered the numbers. The federales only count real (i.e., advanced and standard) diplomas (see the list here) and the data allow us the calculate that uninflated number. 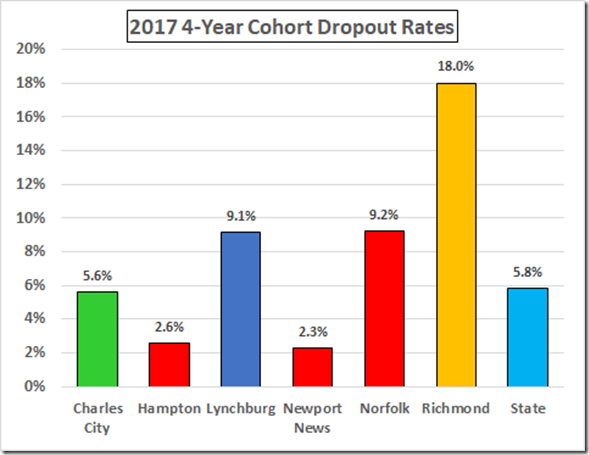 You might think that our awful dropout rate would serve to improve the graduation rate. (Oops! That was written early in the morning before my old brain turned on. Dropouts cannot improve the graduation rate; they can – and probably do – improve the SOL scores insofar as the dropouts probably were not great scholars.) Be that as it may, in terms of the federal rate Richmond was last among the Virginia divisions. 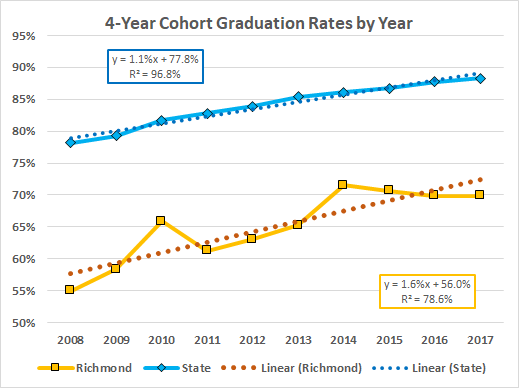 Here are the Richmond diploma rates along with those of the divisions in the previous graph. 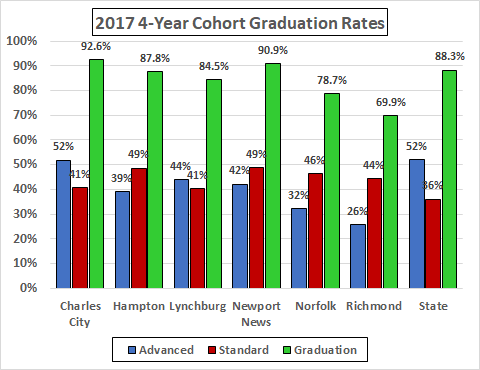 Not only is our total graduation rate in the cellar, we achieved that rate with a preponderance of standard diplomas, in contrast to the average. 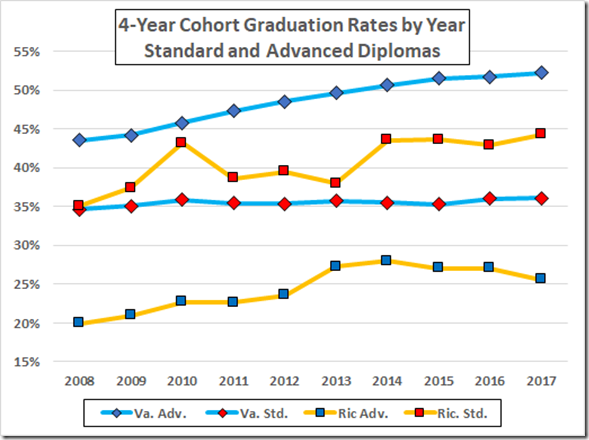 The statewide graduation rate has been rising in recent years, driven by increases in the rate of advanced diplomas. 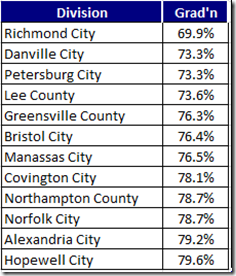 Until the last four years, Richmond has seen increases in both rates. 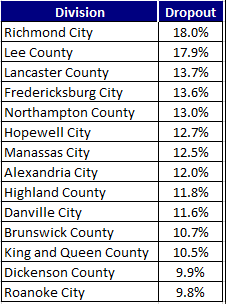 If we fit least squares lines to the totals, we see the state rate increasing at 1.1% per year while the Richmond increase has been 1.6%. 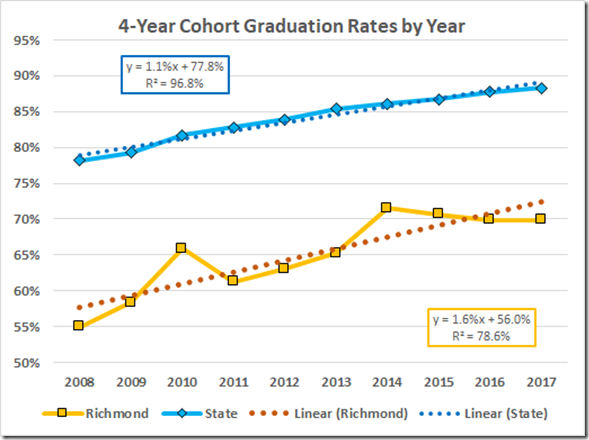 If these rates were to continue, the state average would hit 100% in 2028; Richmond would reach the current state average in that same year. 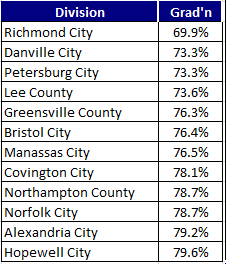 On the other hand, if the Richmond rate were to continue to change at the same rate as the last four years, it would never again rise above 70%. 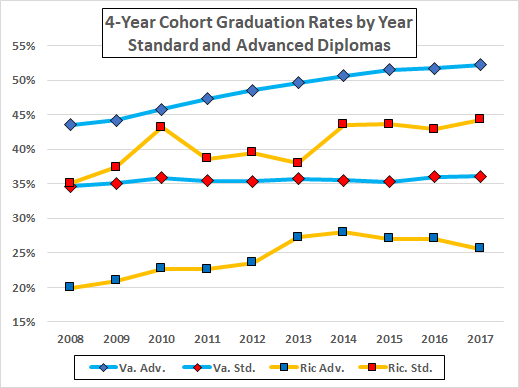 The 416 Richmond students that did not receive standard or advanced diplomas were 30.1% of the Richmond cohort. Of those 416, 249 (60%)were dropouts.